Photo Courtesy of Fred Bergold • This pine siskin recovered after crashing into a window at the Utah home of Fred Bergold. A recent email reminded me that some of the birds that visit us during the winter range far beyond our yards and gardens here in Northeast Tennessee. I received an email from Fred Bergold, a reader who resides in Utah. The kind treatment worked. “When it got its bearings back, it flew to the top of our Colorado green spruce,” Fred wrote. Photo by Bryan Stevens • Pine siskins feast on thistle seeds at a feeder. When I looked at the photos Fred provided, I realized that the bird in question wasn’t one of the warblers but a species of small finch known as a pine siskin. I replied to Fred’s email and offered a quick lesson in distinguishing pine siskins from warblers and other small songbirds. I informed Fred that siskins usually travel in flocks and that they love feeders with sunflower seeds. I also shared with him that I’ve gotten to travel to his home state of Utah twice since 2003. Getting to see some western species — American dipper, lazuli bunting, western tanager, violet-winged swallow — while visiting the state produced some memorable birding moments. Winters, no matter where one lives, can decrease the variety of bird species one sees on a daily basis. I often find myself hoping for the excitement produced when flocks of “irruptive” finches not often seen in the area expand their range into the region. In addition to pine siskins, birds such as evening grosbeaks, purple finches, common redpolls and red crossbills represent a few of these northern finch species that occasionally stage massive migratory movements, or irruptions, into areas far outside their typical ranges. These finches are not the only birds to stage these periodic irruptions. The website birdsource.org identifies several non-finch species — red-breasted nuthatch, Clark’s nutcracker, bohemian waxwing, black-capped chickadee and varied thrush — that undertake periodic winter irruptions. Two of these northern finches — the pine siskin and the red crossbill — are sporadic summer residents on some of the higher mountains in our region. Photo by Bryan Stevens • A flock of pine siskins carpet the ground beneath some feeders as they forage for food. These irruptions are not usually motivated by cold or severe weather. The absence of a favored food source on a bird’s normal winter range is usually a trigger for an irruption. Birds, such as pine siskins, will fly farther than normal in a quest for reliable food sources. Not surprisingly, well-stocked feeders often attract their attention. The pine siskin belongs to a genus of birds known as Spinus, which includes three species of goldfinches and more than a dozen species of siskins, many of them native to Central and South America. Only one species — the Eurasian siskin — is found outside of the New World. Other siskins include the black-capped siskin, hooded siskin, red siskin, black siskin, Antillean siskin and Andean siskin. Photo by Bryan Stevens • The American goldfinch is a relative of the pine siskin, and the two species often associate with each other at feeding stations. Siskins often associate with American goldfinches. In shape and size, the two birds are extremely similar. Unlike goldfinches, however, siskins display extensive streaking on their back and breast. The bill of a siskin is sharp and pointed. Overall a drab brown in coloration, siskins also show some surprisingly bright yellow coloration in their wings and tails. Although sociable, individuals can display some irritable tantrums when competing for prime space at feeders. Some people quickly discover that a large flock of pine siskins is quite a drain on the daily allotment of feed provided for backyard birds. For such small birds, they have large appetites. Siskins are also extremely tame and can often be approached quite closely. A few years ago during a particularly frigid cold snap, I succeeded in luring a pine siskin to land on my gloved hand, which held some sunflower seeds. Needless to say, it was a very memorable, intimate moment. In addition to this unusual tameness, siskins are extremely vocal birds. These birds have a shrill trill that sounds almost mechanical to my ears. Large flocks also produce a constant twittering noise as they perch in trees or on feeders. Next month will offer an opportunity to participate in the annual Great Backyard Bird Count, which is a free, fun, and easy event that engages bird watchers of all ages in counting birds to create a real-time snapshot of bird populations. 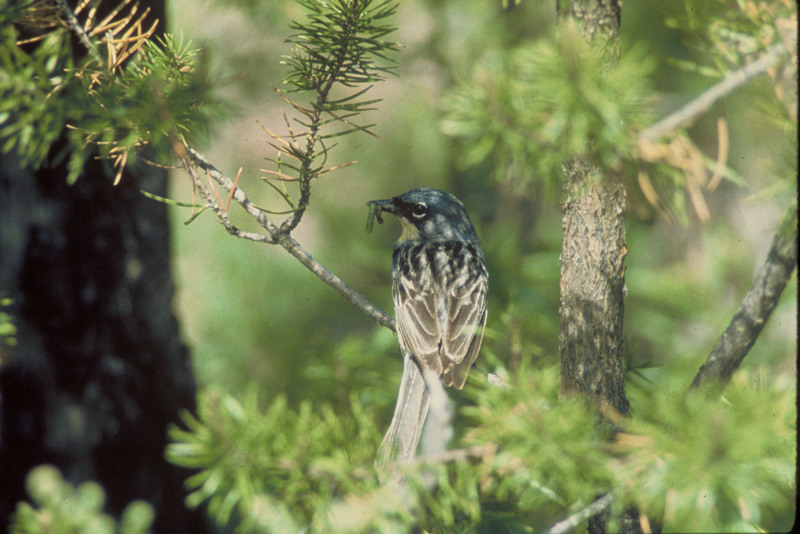 Recording visiting birds such as pine siskins is an important component of the GBBC. Participants are asked to count birds for as little as 15 minutes (or as long as they wish) on one or more days of the four-day event and report their sightings online at birdcount.org. Anyone can take part in the Great Backyard Bird Count, from beginning bird watchers to experts, and you can participate from your backyard, or anywhere in the world. The 21st annual GBBC will be held Friday, Feb. 16, through Monday, Feb. 19, 2018. Please visit the official website at birdcount.org for more information. I’ll also focus on the GBBC more in upcoming columns, including information about activities planned at a local park. This entry was posted in Abingdon, Birding, Birds, Bristol, Bristol Herald Courier, Bryan Stevens, Bryan Stevens Feathered Friends, Citizen Science, Elizabethton Star, Endangered Species Act, Erwin Record, Evening grosbeak, Great Backyard Bird Count, Johnson City Press, Jonesborough Herald and Tribube, Kingsport Times, Our Fine Feathered Friends, Project FeederWatch, Uncategorized and tagged Blogs, Bristol Herald Courier, Elizabethton Star, Erwin Record, Evening grosbeak, Great Backyard Bird Count, greeneville sun, Kingsport Times-News, nature, North Carolina, Tennessee, The Erwin Record, Virginia, Winter weather on February 3, 2019 by Bryan Stevens. Photo by Jean Potter • A common nighthawk rests on a metal railing. With September advancing on the calendar, I have been keeping an eye on the skies. For the most part, I focus on the upper branches of trees and feeders during the migration season, but I don’t forget the need to look skyward from time to time. The reason? Well, that’s the best way to detect soaring raptors or flocks of migrating common nighthawks. The autumn sky is also a popular flyway for other birds, including chimney swifts and swallows. So, what is a common nighthawk? First, this bird, despite what is implied by its name, is not a hawk. It’s also not strictly nocturnal. Particularly in the fall, nighthawks are active during daylight hours when engaged in catching winged insects. Outside of fall migration, these birds can often be observed over large parking lots or well-lit streets, snatching up insects swarming around the light poles. The common nighthawk is one of three members of the nightjar family found in the region during the summer months. The other two nightjars are the whip-poor-will and chuck-will’s-widow, birds that produce their namesake vocalizations in the nocturnal hours. Both of these species migrate, but they don’t take the dramatic approach employed by nighthawks. Each fall, common nighthawks form large flocks, ranging in size from dozens to hundreds or even thousands of individuals, as they migrate south for the winter. Early American naturalist and artist painted this dynamic scene of common nighthawks. The whip-poor-will, after the common nighthawk, is the second most widespread member of its family to spend its breeding season in North America. The whip-poor-will ranges from southern Canada to the Gulf states. This bird also occurs in Arizona, New Mexico and southwestern Texas. The whip-poor-will favors habitat consisting of deciduous woodlands and the edges of forests. All members of the nightjar family feed exclusively on insects that are caught on the wing. In this respect, the nightjars can be considered the nocturnal counterparts of the swallows. The nightjars have comparatively large, gaping mouths they use to scoop up flying insects. They also have large eyes, an adaptation to their nocturnal lifestyle. Whip-poor-will numbers have been declining in the past few decades. These nocturnal birds frequent woodland edges, but they seem to be rather particular about such habitats. A forest that is too mature seems to hold little interest for them. Disturbed habitats, such as those created by logging, are acceptable to the birds once secondary growth begins. As this new growth matures, however, the whip-poor-will apparently abandons such territory. Because of these requirements, whip-poor-wills can be somewhat localized in their distribution and sometimes difficult to locate. Photo by U.S. Fish and Wildlife Service • A common nighthawk finds a perch for a brief rest. When I was a kid, one of my favorite summer activities was sitting on the front porch of my grandparents’ home and listening to the whip-poor-wills call after dark. I remember how the plaintive call would be repeated for long intervals before a passing automobile’s headlights might frighten the bird into silence. Then, after a brief pause, the “whip-poor-will” calls would, tentatively at first, begin again and continue throughout the night. Today, I’m living in my grandparents’ old home, and the whip-poor-wills no longer call. I heard a single individual that called for a single evening back in May of 1997, but that was apparently a migrating bird that did not remain in the surrounding woodlands. The only member of the nightjar family that I dependably encounter at home these days is the common nighthawk, and then only during that narrow window of late summer and early autumn. Unlike whips and chucks, the common nighthawk isn’t active only after dark, which makes it much easier to observe these birds. They look somewhat like swifts and swallows but are much larger. They are brownish-gray birds with pointed wings and forked tails. They are easily identified by distinctive white patches on the underside of their wings. The nightjar, or Caprimulgidae, family of birds is also sometimes known as “goatsuckers.” There are almost 80 species of nightjars in the world. Less than 10 occur in North America. The common nighthawk, whip-poor-will and the chuck-will’s widow are neotropical migrants. While they breed in a wide range of territory in North America, they spend their winters in Central and South America. Like all nightjars, nighthawks feed almost exclusively on insects, which they catch on the wing. Many of the common nighthawk’s relatives have been given descriptive names, such as long-trained nightjar, collared nightjar, spot-tailed nightjar, red-necked nightjar, golden nightjar, fiery-necked nightjar, swamp nightjar, pennant-winged nightjar, lyre-tailed nightjar, little nightjar, sickle-winged nightjar, rufous-bellied nighthawk, short-tailed nighthawk, sand-coloured nighthawk and least nighthawk. So, keep looking skyward. The next flock of migrating common nighthawks may fly over your home. These flocks are usually on the move throughout September although they begin to appear as early as late August. They can also appear almost magically, as if out of thin air. First, observers may see one of two birds, then several, followed quickly by dozens or sometimes hundreds as they wheel and cavort in the skies overhead with impressive grace and agility. I’ve seen flocks that would easily number more than 500 birds in locations throughout the region, although flocks often number only a couple of dozen birds. The two flocks I’ve observed so far this migration season numbered about thirty and fifty birds, respectively. Photo by Bryan Stevens • Rising clouds provide a backdrop for a flock of migrating nighthawks. This entry was posted in Abingdon, Bird, Birding, Birds, Bristol, Bristol Herald Courier, Bryan Stevens, Bryan Stevens Feathered Friends, Carter County Compass, Common Birds of Northeast Tennessee, Elizabethton Star, Endangered Species Act, Erwin Record, facebook, Johnson City Press, Jonesborough Herald and Tribube, Kingsport Times, McDowell News, Migration, nature, Nighthawks, nightjars, Uncategorized and tagged Autumn, birds, Blogs, Bristol Herald Courier, Common Nighthawk, elizabethton bird club, Elizabethton Star, Erwin Record, Fall Bird Count, Fall migrants, Goatsuckers, greeneville sun, Johnson City Press, Jonesborough Herald and Tribune, Kingsport Times-News, nature, Virginia on September 30, 2018 by Bryan Stevens. The 75th consecutive Elizabethton Christmas Bird Count held last month shattered records for this long-running survey. This year’s CBC was held on Saturday, Dec. 16, with 25 observers in six parties participating. The 85 species tallied established a new high for this count, shattering the old mark of 80 species set in 2012 and again in 2016. The average total over the last 30 years of the Elizabethton CBC is 72 species. Participants included Fred Alsop, Jim Anderson, Jerry Bevins, Rob Biller, Rick Blanton, Kevin Brooks, Gil Derouen, Harry Lee Farthing, Dave Gardner, Carl Hacker, Jacki Hinshaw, David Irick, Rick Knight (compiler), Roy Knispel, Richard Lewis, Joe McGuiness, Charles Moore, Brookie and Jean Potter, Brenda Richards, Chris Soto, Amber Stanley, Bryan Stevens, Kim Stroud, and Scott Turner. I took part in this CBC, as I have for many years, with fellow members and friends of the Elizabethton Bird Club. Participation in this annual survey has been a part of my holiday traditions for the past 20 years. The tradition of the CBC, however, goes much farther back. According to the National Audubon Society’s website, the tradition of the Christmas Bird Count arose from a less than bird-friendly custom. By the turn of the 20th century, so-called sportsmen would conduct a “Side Hunt,” a rather bloodthirsty Christmas custom that saw hunters competing to see who could score the largest amount of feathered and furred corpses. It was a huge step forward for conservation when preeminent ornithologist Frank M. Chapman proposed a new holiday tradition. His radical idea was to count birds during the Christmas season rather than hunting and killing them. Ornithologist Frank Chapman organized the very first Christmas Bird Count back in December of 1900. The Christmas Bird Count is now conducted each year on dates between Dec. 14 and Jan. 5. The first CBC took place in December of 1900 with 27 observers participating at 25 locations in the United States and Canada. Fifteen of the counts were conducted in the northeastern United States in an area ranging from Massachusetts to Philadelphia, Pennsylvania. Results from that first count in 1900 didn’t truly reflect the diversity of North America’s birds, but they were nonetheless interesting. The Greater Boston CBC consisted of only one participant and found only 17 species. However, some of those species included such good birds as American tree sparrow, brown creeper, Northern shrike and Northern bobwhite. The Elizabethton Bird Club traditionally compiles the results from its two annual CBCs (Roan Mountain as well as Elizabethton) at its yearly Christmas party. This year when the tallies were added up, count participants were delighted to learn the count had set a new record with an amazing total of 85 species tallied, which is hard to come by in mid-December in Northeast Tennessee. An abundance of waterfowl helped push up the number of species found. A few species are becoming more expected on this annual December count. For instance, greater white-fronted goose was found for the third time in the last five years. Before that, this goose had never been found on this count. The bufflehead, the smallest of the diving ducks, set a new record with 293 individuals found. Four Northern Shovelers represented only the eight time this duck has appeared on the count. Greater Scaup were found for only the seventh time in the last 25 years. Ruddy Duck has now been found three times in the last 25 years, which matches the three occasions it was found prior to that time. Bald eagles, thanks to locations like Watauga Lake and Wilbur Lake, are also becoming more common. Eagles have been found 20 of the last 25 years, but only once prior. Red-shouldered Hawk, which is uncommon in the region, was found for the sixth time in the last quarter-century. Photo by U.S. Fish & Wildlife Service/Lee Karney • A Red-shouldered Hawk perches in branches. Eurasian Collared-Dove appears established in Elizabethton. This dove has been found six of the last nine years since it first made an appearance on the count. All seven of the region’s woodpecker were found on this year’s CBC. The Red-headed Woodpecker has shown up on four counts in the last 25 years. This woodpecker was only found seven times in the years prior to 1992. A Blue-headed Vireo spotted on this year’s count represented only the third time this species has been found. A flock of 75 American Pipits marked only the third time this species has been seen since 1992 on a CBC. Prior to that date, the species appeared only twice on an Elizabethton CBC. Gray Catbird has been found five of the last 25 years, including this year, but only once prior to 1992. Palm Warbler, found only once prior to 1992, has now been found eight of the last 25 years. The single Pine Warbler seen means that this species has now been found four of the last 25 years, but only four times prior to 1992. The European Starling with 1,335 individuals found on count day was easily the most common species on this year’s CBC. The 16 Dark-eyed Juncos, usually a relatively common species on the Elizabethton CBC, represented the fewest juncos ever found on this long-running survey. Greater White-fronted Goose, 1; Canada Goose, 532; Wood Duck,1; Gadwall, 5; American Wigeon, 1; American Black Duck, 2; Mallard, 366; Northern Shoveler, 4; Green-winged Teal, 2; Ring-necked Duck, 14; Greater Scaup, 2; Lesser Scaup, 3; Bufflehead, 293; Hooded Merganser, 4; and Ruddy Duck, 1. Photo by Bryan Stevens • A female Ruddy Duck. Wild Turkey, 33; Common Loon, 2; Pied-billed Grebe, 14; Horned Grebe, 27; Great Blue Heron, 18; Black Vulture, 3; Turkey Vulture, 12; Bald Eagle, 3; Sharp-shinned Hawk, 1; Cooper’s Hawk, 2; Red-shouldered Hawk, 2; and Red-tailed Hawk, 25. Killdeer,17; Ring-billed Gull, 27; Rock Pigeon, 305; Eurasian Collared-Dove, 1; Mourning Dove, 157; Eastern Screech-Owl, 12; Great Horned Owl, 2; Barred Owl, 1; and Belted Kingfisher, 10. Red-headed Woodpecker, 1; Red-bellied Woodpecker, 33; Yellow-bellied Sapsucker, 8; Downy Woodpecker, 27; Hairy Woodpecker, 3; Northern Flicker, 26; and Pileated Woodpecker, 21. American Kestrel, 16; Eastern Phoebe, 12; Blue-headed Vireo,1; Blue Jay, 162; American Crow, 223; and Common Raven, 4. Photo by Bryan Stevens • A Red-breasted Nuthatch at a feeder. Carolina Chickadee, 117; Tufted Titmouse, 84; Red-breasted Nuthatch, 1; White-breasted Nuthatch, 25; Brown Creeper, 4; House Wren, 1; Winter Wren, 6; and Carolina Wren, 75. Golden-crowned Kinglet, 41; Ruby-crowned Kinglet, 8; Eastern Bluebird, 111; Hermit Thrush, 11; Amercian Robin, 277; Gray Catbird, 1; Brown Thrasher, 1; and N. Mockingbird, 49. Eurasian Starling, 1,335; American Pipit, 75; Cedar Waxwing, 154; Palm Warbler, 2; Pine Warbler, 1; and Yellow-rumped Warbler, 154. Eastern Towhee, 22; Chipping Sparrow, 4; Field Sparrow, 8; Song Sparrow, 142; Swamp Sparrow, 5; White-throated Sparrow,102; Dark-eyed Junco, 16; and Northern Cardinal, 111. Red-winged Blackbird, 1; Eastern Meadowlark, 1; Brown-headed Cowbird, 2; House Finch, 100; American Goldfinch, 90; and House Sparrow, 41. The Audubon-sponsored CBC allows counts to also list birds not found on the count day that are seen during count week. This year participants found Redhead ducks, which were not present on count day. Notable misses this year include Ruffed Grouse, American Coot, Wilson’s Snipe, and White-crowned Sparrow. Photo by Bryan Stevens • A male Eastern Towhee waits out a snowstorm. This entry was posted in Birding, Birds, Birds and bad weather, Bristol, Bristol Herald Courier, Bryan Stevens, Bryan Stevens Feathered Friends, Christmas Bird Count, Eastern Screech-Owl, Elizabethton Christmas Bird Count, Elizabethton Star, Emory and Henry College, Endangered Species Act, Erwin Record, History of Christmas Bird Count, Johnson City Press, Jonesborough Herald and Tribube, Kingsport Times, McDowell News, Our Fine Feathered Friends, Roan Mountain Christmas Bird Count, Tennessee, Tennessee Rare Birds, Uncategorized, Winter birds, Woodpeckers and tagged Bristol Herald Courier, Christmas, Christmas Bird Count, elizabethton bird club, Elizabethton Christmas Bird Count, Elizabethton Star, Erwin Record, facebook, Johnson City Press, Jonesborough Herald and Tribune, Kingsport Times-News, McDowell News, nature, Roan Mountain Christmas Bird Count, Tennessee, Virginia, winter on January 7, 2018 by Bryan Stevens. I wrote a few weeks ago about the tendency of long-legged wading birds to wander far afield from their usual coastal haunts in late summer. In the ensuing weeks, numerous sightings of some unexpected waders have been reported throughout the region and beyond. Jeremy Stout, the manager of the Nature Center at Steele Creek Park in Bristol, reported that a great white heron generated some birding excitement among park visitors. Stout noted that the heron was first reported by Sherry Willinger on Monday and Tuesday, Aug. 7-8, and then found again by Ruth and Mary Clark on Friday, Aug. 11. Stout also managed to get a photograph of the heron, which has been seen just outside the park grounds between Ralph Harr Bridge and Highway 126. Steele Creek Park Naturalist Don Holt saw the heron again on Aug. 15. He invited others who see the heron to share their sightings by calling the park’s Nature Center at (423) 989-5616. Reports will help the park staff document the duration of the rare visitor’s stay and keep interested birders informed of its presence. This great white heron was photographed near Steele Creek Park in Bristol. Currently considered the same species as the great blue heron, there is debate among experts about granting the great white heron status as a species in its own right. In early August, Cheryl Livingston reported a great white heron and a great egret at Watauga Lake in Hampton. While only a handful of records exist for the great white heron in this region, these observations will not help boost the lists of any area birders. The great white heron and the great blue heron, scientifically speaking, are the same species — at least for the moment. According to the website for the U.S. Fish and Wildlife Service, this large wading bird, originally thought to be just a white color morph of the great blue heron, might actually deserve consideration as its own species. The website’s profile of the great white heron notes that recent research about the great white suggests that it is at least a subspecies of the great blue heron. Some preliminary unpublished data suggests that the bird may even be a completely separate species. That would be exciting news for many birders, who would be able to quickly add an unexpected bird to their life lists. The majestic great white heron usually ranges throughout south Florida and the Florida Keys, but individuals wander far from those parts of the Sunshine State after the nesting season. Painting by John James Audubon of the iconic Great White Heron of Florida. The great white heron — as its name suggests — differs dramatically in appearance from a great blue heron, mostly in having all-white plumage. In addition, the great white heron has a yellow bill, which is heavier and more solid than the slender bill of the smaller great egret, for which it could be confused at a casual glance. The great blue heron, known by the scientific named of Ardea herodias, can stand 54 inches tall and weigh close to eight pounds. Waders other than great white herons have been wandering this summer. Farther afield, Michael Sledjeski has been reporting little blue herons and great egrets at Rankin Bottoms, which is a birding hot spot at Douglas Lake in East Tennessee. The location is well known among birders as a magnet for shorebirds and wading birds. Sightings of wood storks have been somewhat widespread in Tennessee and Virginia this summer. In addition, other waders are showing up far from their usual ranges. For instance, a roseate spoonbill — a large, pink wading bird — has shown up as far north as Pennsylvania, marking the first time the species has been sighted in the Keystone State since 1968. Photo by Bryan Stevens • Identifying white herons and egrets can be a tricky business. This immature Little Blue Heron is just starting to get the blue feathers of adulthood. I’ve not seen anything as exciting as a wood stork or roseate spoonbill at home, but on several occasions in the past couple of weeks my fish pond has been visited by great blue herons. A couple of these visitors were young birds, which are probably wandering widely during their first summer out of the nest. I’ve also seen green herons at the pond and in the creeks along the linear trail in Erwin. If the great white heron eventually gains recognition as a separate species, I will already have the bird on my Tennessee bird list thanks to a sighting of one several years ago at Musick’s Campground on Holston Lake in Bristol. Ironically, I’ll not have this bird on my Florida list, as I’ve not seen it in its southern stronghold. To learn more about birds and other topics from the natural world, friend Stevens on Facebook at https://www.facebook.com/ahoodedwarbler. If you have a question, wish to make a comment or share a sighting, email ahoodedwarbler@aol.com. This entry was posted in Birding, Birds, Bristol, Bristol Herald Courier, Bryan Stevens, Bryan Stevens Feathered Friends, Carter County Compass, Common Birds of Northeast Tennessee, Elizabethton Star, Endangered Species, Endangered Species Act, Erwin Record, Great White Heron, Herons, Johnson City Press, Kingsport Times, McDowell News, Middlebrook Lake, North American herons, Our Fine Feathered Friends, Rare birds, Steele Creek Park, Uncategorized and tagged Bird, Birdwatching, Bristol Herald Courier, Elizabethton Star, Endangered Species Act, Erwin Record, Great Blue Heron, Great White Heron, Herons, Johnson City Press, Jonesborough Herald and Tribune, Kingsport Times-News, McDowell News, nature on August 27, 2017 by Bryan Stevens. Photo by Lisa Hupp/USFWS • A bald eagle has an average of 7,000 feathers. Bald eagles are protected under the Bald and Golden Eagle Protection Act. For instance, it is against the law to possess their feathers or other remains. Eagles are abundant enough they no longer qualify for listing under the Endangered Species Act. The Endangered Species Act serves as one of the strongest, most effective wildlife protection laws in the world. Although the ESA was not meant to protect only birds — the law actually protects everything from bats and whales to wolves and shellfish — it has done an outstanding job ensuring that our feathered friends continue to fly free and thrive in a world they must increasingly share with human beings. According to Earthjustice — an environmental law organization that uses the power of the law to fight for the earth and its inhabitants — the ESA was passed with overwhelming bipartisan support more than 40 years ago to provide a legal safety net for wildlife, fish and plant species that are in danger of extinction. Photo by Scott Flaherty/USFWS • The California condor is an example of a species saved from the brink of extinction thanks to the Endangered Species Act. Much work remains to be done to protect this large bird. Earthjustice and other environmental groups are warning that some members of the current Congress want to slash the Endangered Species Act, threatening the very existence of the imperiled wildlife and ecosystems the Act protects. Some politicians from the state of Utah seem to be leading this effort, which is a sad irony considering the wealth of natural majesty the unique lands of Utah has to offer. None other than President Richard Nixon, a Republican, signed the ESA into law back on Dec. 28, 1973, and it was an effort that crossed political party lines that made the legislation a reality. Biologists warn that our planet is facing a sixth wave of mass extinction, according to a release from Earthjustice. The Endangered Species Act, which has prevented 99 percent of the species under its care from vanishing, is precisely the kind of effective tool needed today. 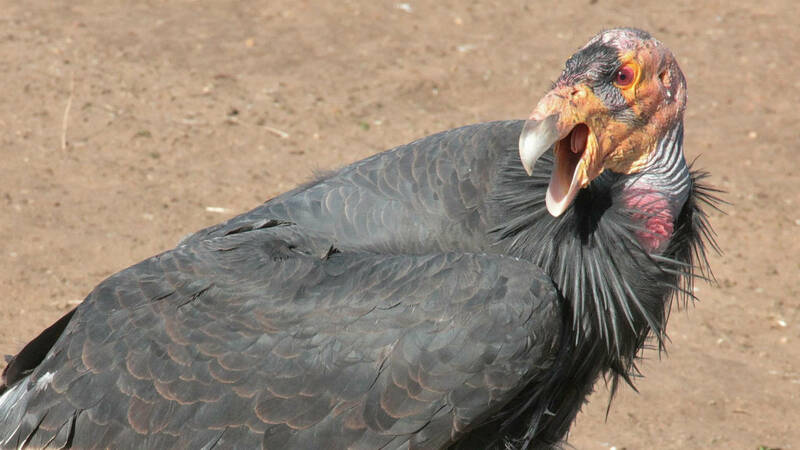 It has revived the bald eagle, the American alligator, the California condor and many others. House Natural Resources Chairman Rob Bishop (R-UT) has said he wants to “repeal and replace” the Endangered Species Act. Others are supporting legislative proposals that would make it harder for the U.S. Fish and Wildlife Service to resolve Endangered Species Act lawsuits. The ESA is truly a prime example of the old saying, “If it’s not broke, don’t try to fix it.” Bishop and his allies, to put it plainly, are wrong. Photo by Lou George/USFWS • The Kirtland’s Warbler is an endangered songbird that has seen its numbers slowly increase thanks to the protection of the Endangered Species Act. If there’s ever been a government regulation that has done what it set out to do, it has been the Endangered Species Act. Without the ESA, many of our birds, including the nation’s official bird, might no longer still exist on the planet. The bald eagle had been reduced to a mere 417 pairs in 1963. With the passage of the ESA, the eagle began to rebound. In 2007, in a highly publicized success story, the existence of 11,040 pairs of bald eagles in the United States allowed this majestic bird to be removed from its listing under the ESA in 2007. Photo by USFWS • Whooping cranes still exist largely due to protections afforded them by the Endangered Species Act. 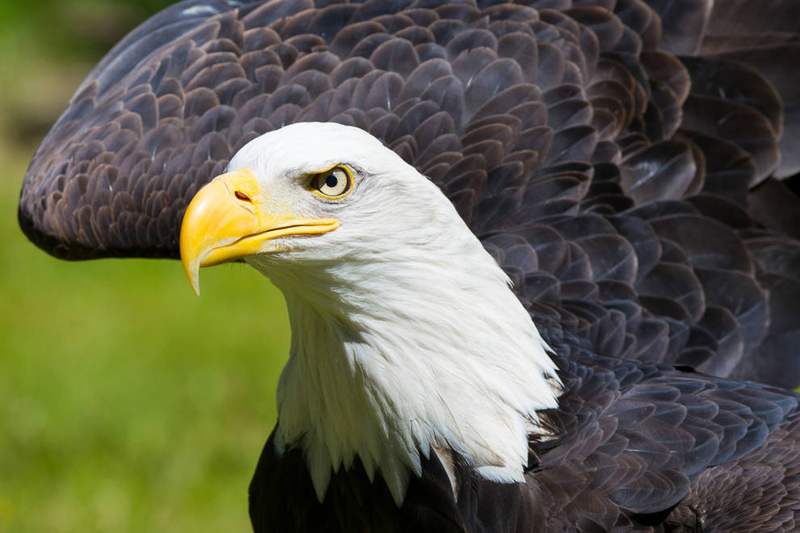 The bald eagle is only one of the many birds to benefit from the protection of the ESA. 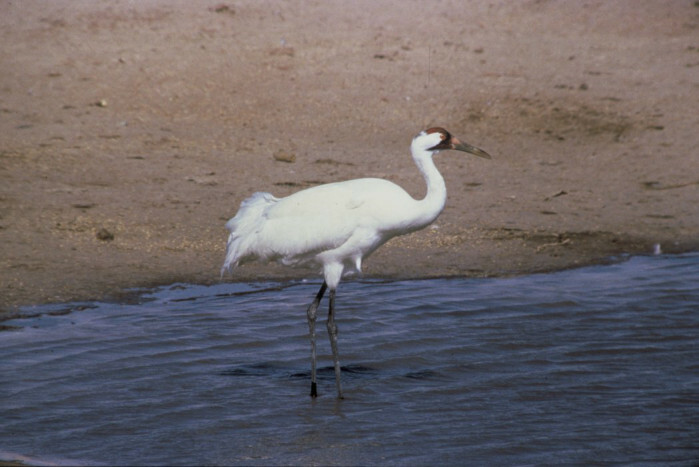 The tall and stately whooping crane and the beautiful and tiny Kirtland’s warbler are some of the other birds that are slowly showing population increases once they were afforded intensive protection under the ESA. The nene, or Hawaiian goose, and the peregrine falcon — the world’s fastest bird — have also received much needed protection. Lest anyone think that eagles and other formerly endangered species are completely out of the woods, just consider the recent rash of bald eagle shootings in Tennessee. Two eagles, one in Rhea County and one in Meigs County, were victims of shootings. The severity of their injuries resulted in both birds being euthanized. It’s heartbreaking to think that anyone would shoot a bald eagle, a bird that all patriotic Americans should revere as a lofty symbol of the nation’s majesty. The shootings are a reminder that it’s still not a safe world for many of the birds and other creatures that share the planet with us. The ESA is a marvelous piece of legislation that gives a measure of protection to the helpless. The law allows all Americans to share in the responsibility of being wise stewards of God’s diverse and wonderful creatures. Photo by Steve Maslowski/U.S. 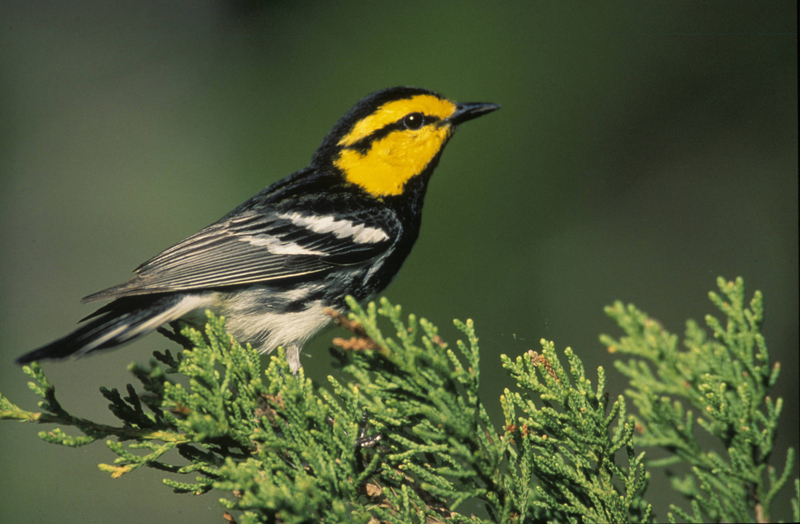 Fish and Wildlife Service • The golden-cheeked warbler, a beautiful but endangered songbird that nests in Texas, is one of many birds that benefits from protections provided by the Endangered Species Act. Demanding that the government keep the ESA strong and intact is not and should not be mere politics. It’s showing that Americans still value wildlife and the rights of future generations to enjoy that wildlife over money and short-term profits. Left or right, Republican or Democrat, the Endangered Species Act should be immune to political differences. On a purely personal level, I hope to one day see such endangered songbirds as the golden-cheeked warbler and the black-capped vireo, and I want the same for future generations. That’s not likely to happen without the protections of the ESA remaining strong and intact. Let your state and federal representatives know that you support continued protections for birds and other wildlife. We can co-exist with the amazing variety of wild creatures that share our planet. It’s just a matter of priorities. Our congressional representatives and senators need to know Americans aren’t willing to tolerate attacks on the ESA. Our president and his administration need to receive the same message. Photo by Ted Heuer/U.S. 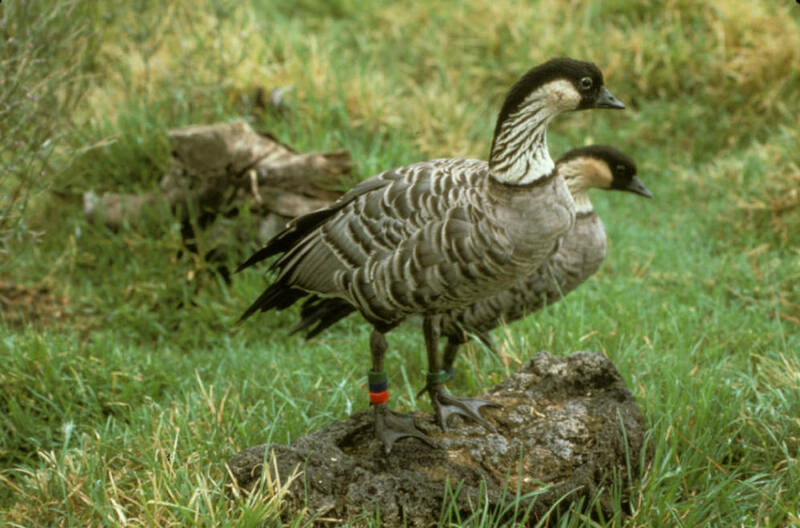 Fish and Wildlife Service • The Nene, or Hawaiian goose, has gradually increased in numbers thanks to the Endangered Species Act. If you enjoy birds, keep visiting local and state parks. Continue planning trips to National Parks and Wildlife Refuges. Don’t stop feeding your backyard birds. Most importantly, fight to make sure the wildlife that makes the world a richer place continues to find that humans do make good neighbors. For information on how to contact your government officials to express your thoughts on the value of the Endangered Species Act, visit http://www.usa.gov/elected-officials. To learn more about birds and other topics from the natural world, friend Stevens on Facebook at https://www.facebook.com/ahoodedwarbler. He is always posting about local birds, wildlife, flowers, insects and much more. This entry was posted in Birding, Birds, Endangered Species, Endangered Species Act, Uncategorized and tagged Birding, birds, Birdwatching, Bristol Herald Courier, Bryan Stevens, Carter County Compass, Elizabethton Star, Endangered Species, Endangered Species Act, Erwin Record, Feathered Friends, McDowell News, Northeast Tennessee, Our Fine Feathered Friends, The Erwin Record, Winter birds on March 12, 2017 by Bryan Stevens.